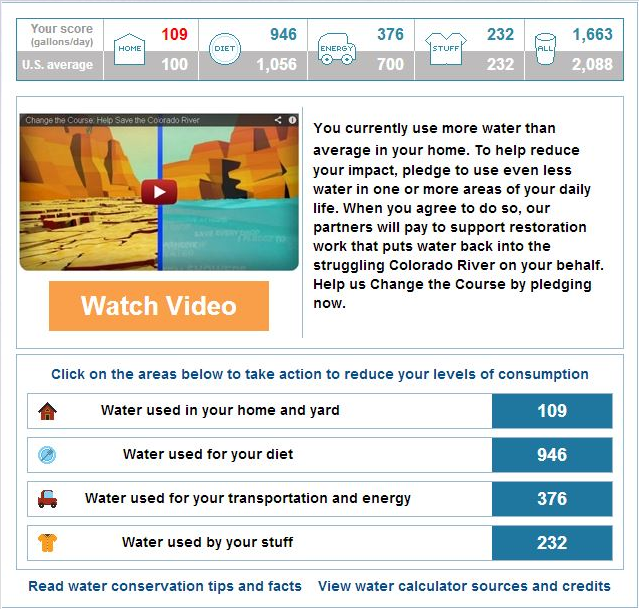 Water Footprint Calculator - AP Environmental Science! As you can see my water footprint shows that I use less gallons than the average U.S. residence with all the categories except the home. The reasons of my water use in my home is the amount of energy I use and my time in the shower. My dietconsists of beef or pork on a daily basis. I walk to and from school. I don't go on vacations or to other countries. My mom doesn't buy a lot of new furniture or renovate the house. I try to go to thrift stores, swap meet, or Good Will to get most of my clothes so I don't spend a lot to buy brand new ones. My overall score was 1,663 out of 2,088.